Red Text indicates teams that have are in as automatic qualifiers. Purple Highlight indicates teams that are protected seeds. 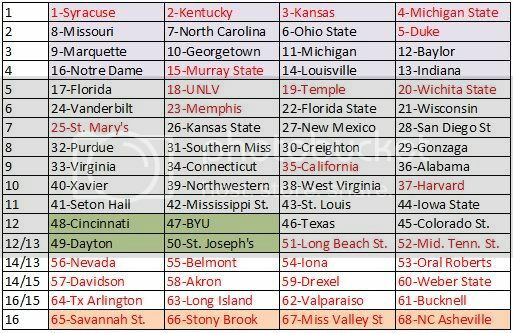 This was done to primarily reflect changes from Saturday, February 25, but also includes the USF/Cincinnati game. The Bulls are still on the outside looking in, but could get in with one more win. Saturday's action saw little change. For Marquette, the biggest change was moving up to the top 3-seed after Michigan lost. At the bottom of the bracket, Dayton and St. Joe's both move into the field, while LSU's loss dropped them, and idle Illinois also fell out of the field. The Big East still leads the way with 9 bids, but USF could make it 10. The Big Ten slips to 7 bids, though both Illinois and Minnesota aren't far out, and the surprising Iowa Hawkeyes are also in the conversation due to 4 top-30 wins. They aren't yet on the bubble, but if the bubble had a bubble, that's where Iowa would be. One team I look at that I think might make it in is VCU, who just moved into the "Next Four Out". Honestly, I don't think they are deserving. They have 1 top-50 win, and that's against #49 South Florida when they were missing two of their top players. But they do have a gaudy 25-6 record. The problem is that 2 of those losses came against sub-100 teams. Unless they win the auto-bid, VCU does not (and likely will not) deserve to make the field. But they didn't deserve to make the field last year, and we all saw how that worked out. Being a Selection Committee darling may play in their favor. I do not think the Pac-12 will only get one team in the tournament. I think Cal and Washington get included.